Sacramento, CA— Yesterday, Governor Jerry Brown signed into law Senate Bill 1393, authored by State Senators Holly Mitchell (Los Angeles) and Ricardo Lara (Long Beach). With his signature, Brown, ended the mandatory application of the 5-year sentence enhancement given for each prior serious felony on a person’s record at the time when a person is currently charged with a serious felony. The bill is part of Senator Mitchell and Senator Lara’s Equity and Justice Package of 2018, which seeks justice reforms for juveniles and adults. California has some of the most severe sentence enhancements in the nation. According to the Public Policy Institute of California (PPIC), California has more than 100 separate code sections that add years to a person’s prison or jail sentence. PPIC states that as of 2016, one of the most commonly used sentence enhancements was this five-year enhancement for serious priors. Close to 100,000 years’ worth of this five-year sentence enhancement have been applied on people currently under CDCR custody. 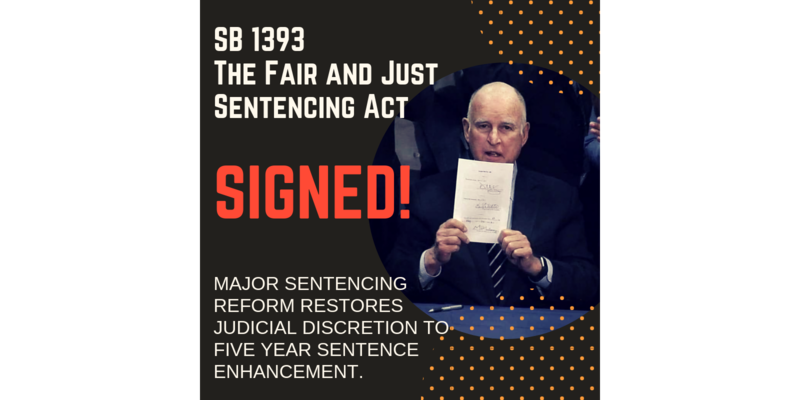 Sentence enhancements have the effect of sentencing thousands of people in California too long periods of incarceration in overcrowded state prisons and county jails, destabilizing families and communities. Furthermore, this failed approach has proven enormously expensive, robbing state and local budgets that should be spent on schools, health and social services, and policies that actually reduce drug use — drug treatment, after-school programs, and housing, among them. The Fair and Just Sentencing Reform bill will help restore balance in the judicial process, address extreme sentences, and reduce racial disparities in the criminal justice system by allowing judges to decide what is best in the interest of justice. The passage of this bill builds on the growing momentum in California to enact criminal justice reforms that divest from ineffective mass incarceration policies and invest in community-based solutions like mental health-care, education, and substance-use treatment.